Musical Blasphemy or Design Genius? For quite a while, I've been toying with an idea. Depending on the day, I could be on either side of the fence. Painting a piano... is it musical blasphemy or design genius? I grew up with this piano. It has stories. Stories that include being doused with Sprite while partying like it was 1999 (when it turned 1999). Prior to my parents owning the piano, it was my grandmothers. It is not, however, a precious antique. The plastic keys are chipped, the finish could use help in some spots, and the bench has been repaired several times. 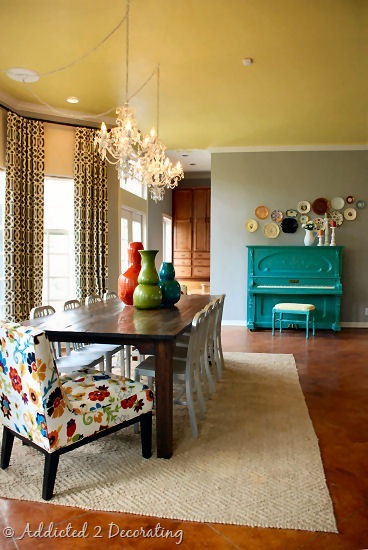 The sentiment with the piano far exceeds it's value, so I've been considering making it more of a focal point. with paint. 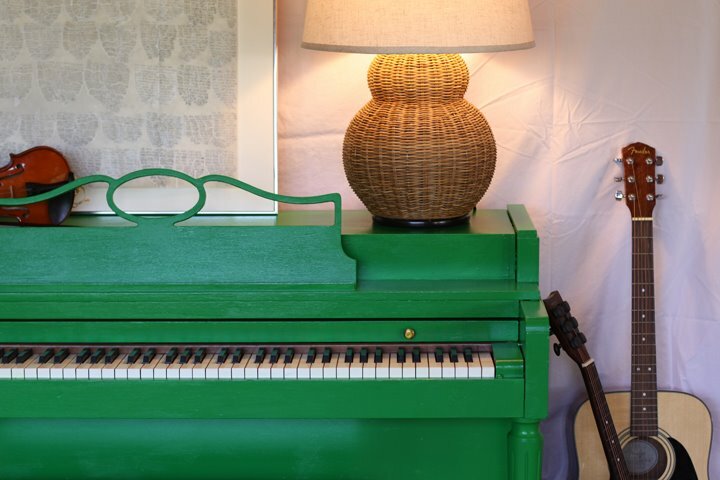 I dream about this piano from Design Mom. That green is a.maz.ing. 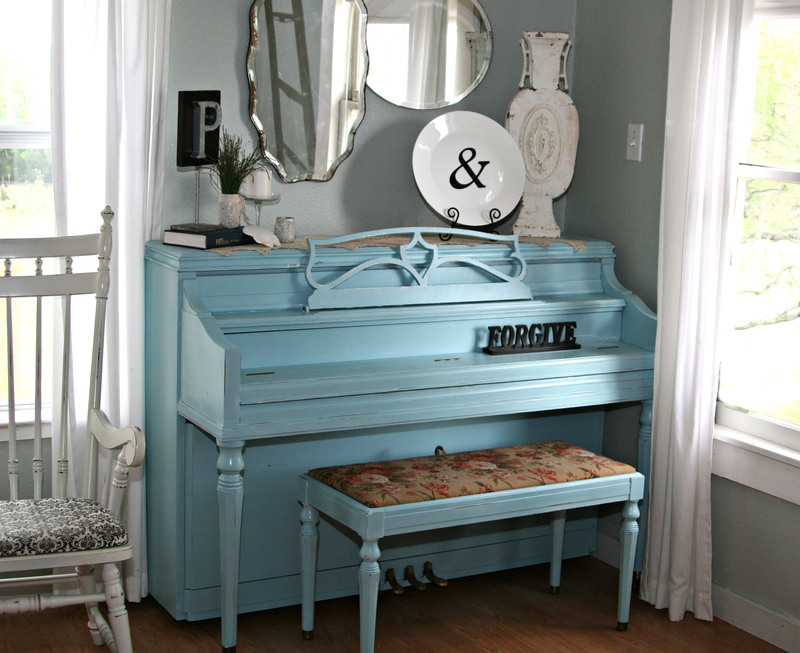 Shabby chic normally gets glares from me, but Lisa from The Pennington Point just hit the nail on the head with her blue piano. Yellow? Yes, please. 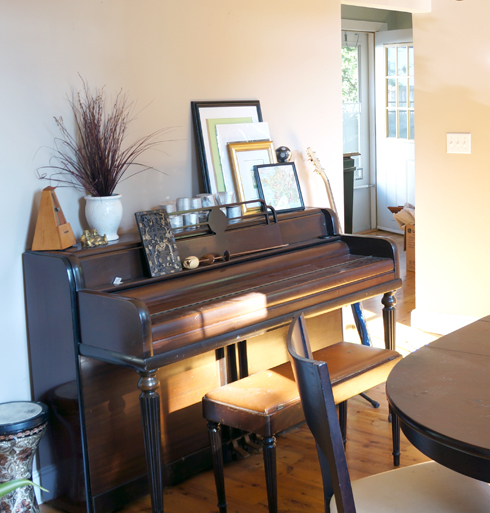 Bridget at Bake at 350 certainly knows how to treat a $99 thrift store piano right. Yup, definitely on the "paint it" side today, especially after looking at those pianos again. 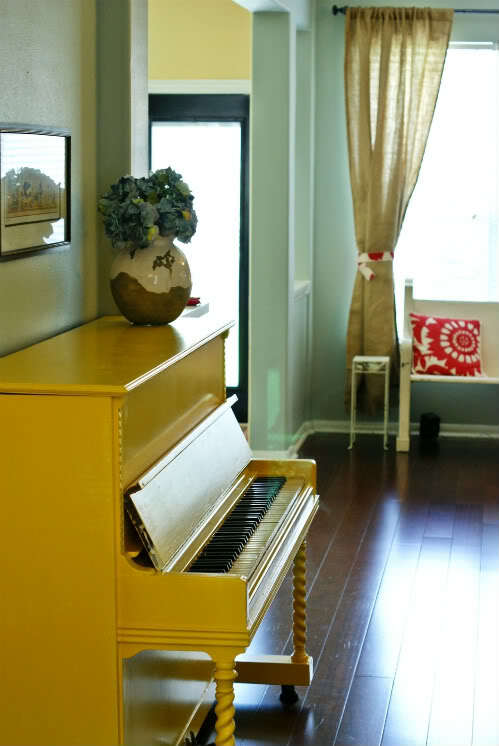 I think a bright color would bring out the art deco lines of my piano and make it feel more special. Of course getting it tuned more than once every 3 years would probably make it feel special, but we really don't want to spoil it too much. No one likes a pampered piano. Am I right? I had a busy weekend spending quality time with my taxes, house, and good friends. I went to a rummage sale at a local church and found a fantastic oversized frame for just $4! I forgot to take a picture of it before I scrambled out the door for the 9to5 this morning (oops), but be assured that once cleaned up and painted, it's going to be phenomenal! I currently have it on the floor, leaning against the wall. It has no back, just frame and glass- a little odd. I think the cats are confused by it. I've come into the room multiple times since its purchase Saturday AM to find miss Daisy sitting in front of it, looking into it. Curious. Maybe she sees something in it I don't ;). Yesterday was spent enjoying musical theater. After having all the songs memorized for over a year, I finally saw a travelling production of Avenue Q. Such a good time!!! If you aren't familiar with the show- think Sesame Street for adults. Just check out the list of songs and you'll see what I mean. Hilarious! I have a feeling the Bad Idea Bears will be a running joke with our friends from now on. Since the reason I started this blog was to find my 'purpose,' I thought I would honor that in the form of song. Please enjoy Avenue Q's "Purpose." I can honestly say, my explorations from this blog have opened my eyes to new things and I've been able to re-bond with design. Twitter and exploring other design blogs have kept me excited about the world of design and DIY projects, and my new house has given me a blank canvas to explore all these new-found ideas. I can't wait to see where it leads me next! Next week I'll have some new and exciting posts to show you as the house starts coming together. For today, enjoy the music video for Hubby's band, The Evening. Hopefully it will inspire you to come to the Middle East tonight and check them out, or download their single, Something New from Amazon or iTunes.